Meal preparation for the week is critical to the success of your diet plan and should be super easy in my opinion – especially when it comes to preparing breakfast, which is an essential meal on any weight loss program! If you’re busy, it’s ideal if your meals can be fixed in a snap, so you can be on your way. I’m not one to skip breakfast (or any meal, really) but I also don’t have a lot of time. And I prefer to get a nice hot meal, and ideally one that includes veggies. 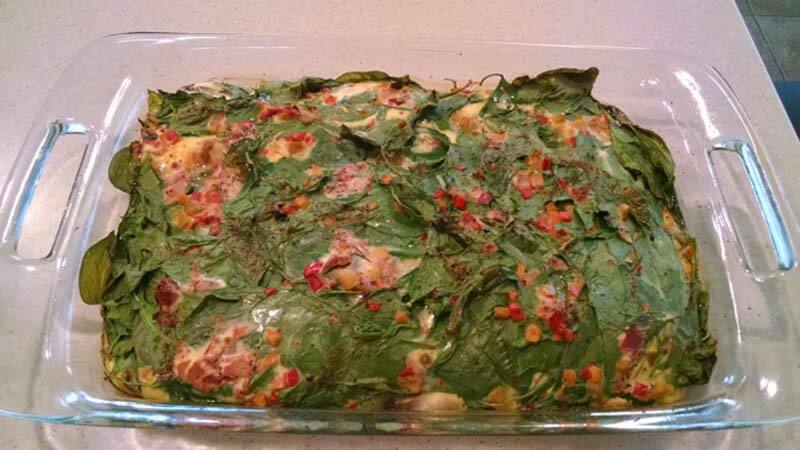 So here’s my “go-to” for a simple, 4 ingredient egg casserole that can be prepped in advance for the week. It’s one of my best breakfasts for weight loss and healthy eating! Once prepped, it will last in your fridge for at least 5 days, and you can freeze any leftovers, if you have any. It’s low in calories, low in fat and carbs, high in protein, and full of veggies. 1. Preheat oven to 395 degrees. 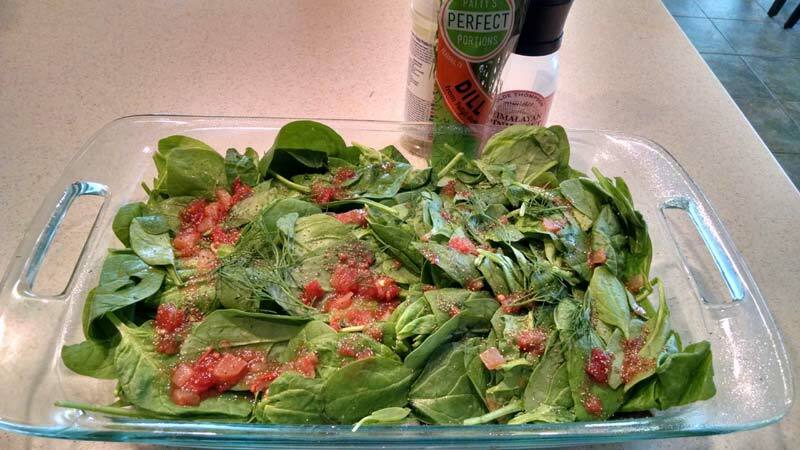 Spray an oven safe dish with non-stick spray and layer on your first serving of veggies. ANY veggie will do. You could use onions, peppers, zucchini, carrots, whatever. 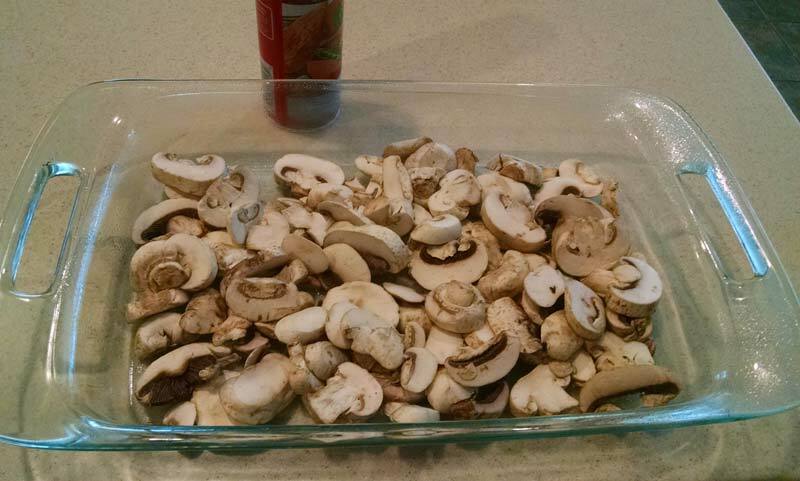 My first layer here is pre-chopped mushrooms. 2. Next, add another layer of leafy greens, if you like. I add spinach. Second layer… spinach! 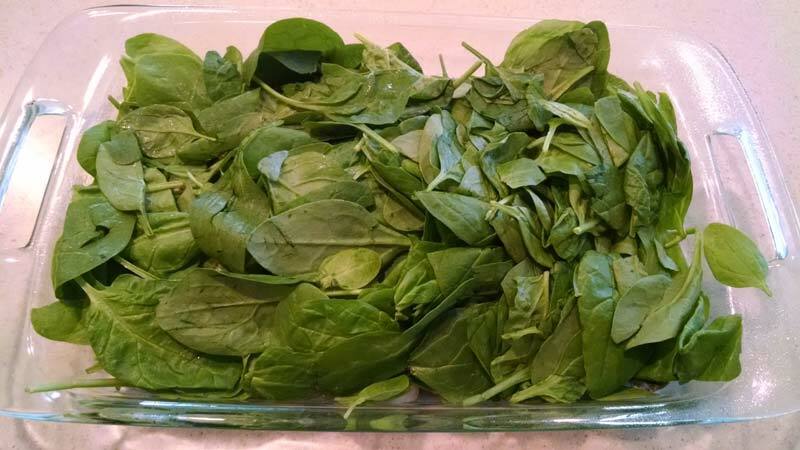 A LOT of spinach! 3. Add spices (salt, pepper), salsa (if you wish, I like to because I love the taste), and fresh herbs if you have some (I’m using dill because I like how it tastes with eggs). 4. Add your final layer of eggs. 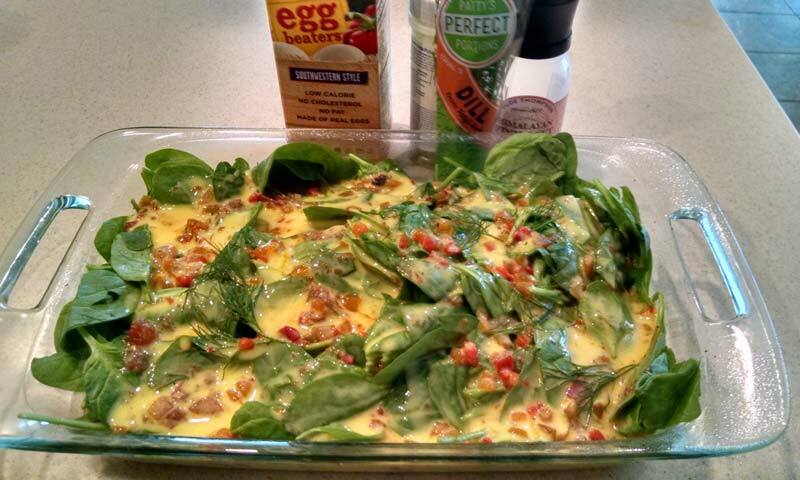 I use 1 large carton of liquid egg substitute (I love the taste of the Southwestern flavor). Eggs, eggs whites, or egg substitutes! According to the label on the carton, the box contains 18 servings of 20 calories each. 20 calories isn’t very much, and once cooked, I divide the pan into 8 servings, not 18. The veggies add a really small amount of calories, and I don’t worry about it, but if you’re adding denser veggies like potatoes or whatever, you might want to consider how it will affect the calorie totals. 5. Bake in the oven at 395 degrees for 40 minutes. Don’t worry… it tastes better than it looks! You could use real whole eggs or a combination of eggs and egg whites, or MuscleEgg, or all egg whites. Just realize that will change the calorie totals, which is something you may want to account for. For this example, if I divide the pan into 8 servings, each breakfast serving is about 67 calories with 12 grams of protein, and 4 grams of carbohydrates, and a minuscule amount of fat. To complete this meal, you will want to add a friendly fat source (small amount of peanut butter, avocado, or fish oil), and your favorite breakfast carbohydrate (fruit, oatmeal, cream of wheat, cereal, etc). If you’re doing the low carb thing, then skip the carbohydrate and increase your fat portion.